Home › Advice › What is your accident risk on a motorbike? A study by Austroads has revealed the factors that increase your risk of having a motorbike crash. Riders using sports motorbikes have greater odds of being involved in serious injury crashes and older riders using sports motorbikes have an even greater risk. Sports motorbikes have a less relaxed riding position, can have twitchy handling and are designed to go fast. Riding an unfamiliar motorbike increases the risk of being in a crash. Route familiarity increases crash risk, i.e. if you ride the same route every day, you may become complacent about its dangers. Older riders have a lower overall risk of crashing but spend much longer in hospital as a result of crashes compared to younger riders. Riders who wear full protective gear (i.e. not just a helmet) showed much less risk of being in a crash, presumably because of overall attitudes about rider safety and that protective equipment (particularly the right gloves and boots) give you better control over your bike. Impact protectors didn’t seem to make much difference, though. Recreational riding increases the risk vs commuting. Most injuries are minor and involve the legs and arms, but serious injuries mainly involved the torso (mostly the chest). As all riders wear helmets, head injuries are infrequent but facial injuries are common in riders that don’t wear full face helmets as the predominant impact point is in a crash is the face or forehead. Neck injuries can occur. Arm and leg injuries are mainly caused by contact with the road surface and vegetation, torso injuries are mainly caused by contact with other vehicles and roadside objects like guardrails and pelvis injuries are mainly caused by contact with the fuel tank. Read more about motorcyclist injuries. 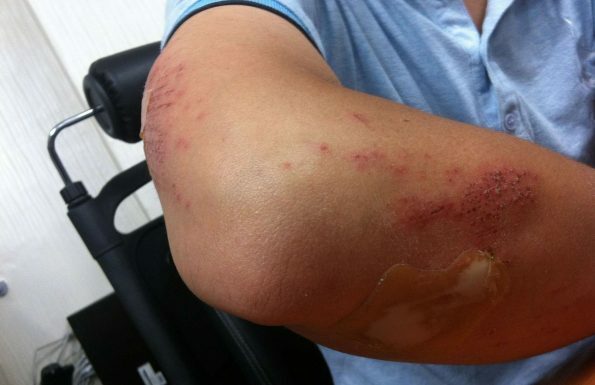 Road rash is caused by sliding across the tarmac. It can leave permanent scars. Riders should choose a motorbike with antilock braking and must maintain their suspension, tyres and brakes. They must also learn the best road position to use so that they have an excellent view of developing hazards ahead. Motorbikes are inherently unstable and it’s easy to travel at an inappropriate speed, but the roads are frequently unforgiving and contain potholes and loose stones that make it harder for a motorcyclist to control their bike. Read about 11 types of road surfaces that are dangerous to riders. Inexperienced riders should not choose routes and motorbikes that exceed their skill level.